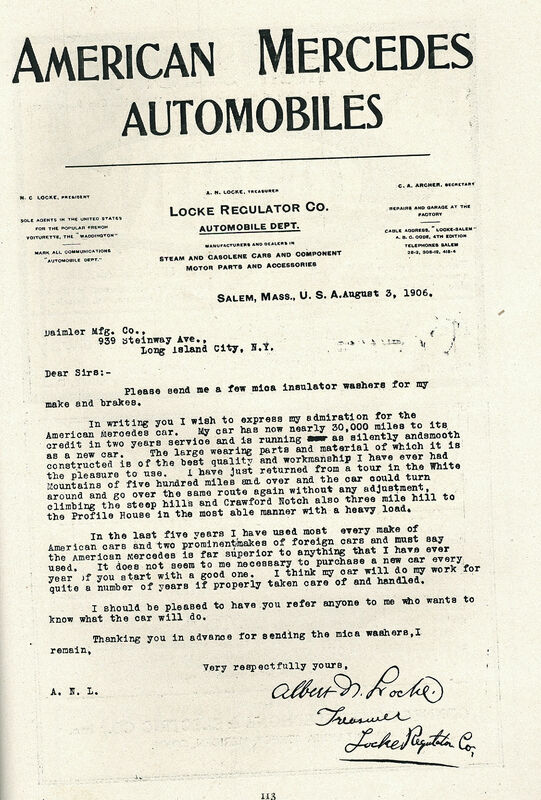 As a follow-up to the January 15, 2011 post "The American Mercedes Manufactured in Astoria Queens", Sam Berliner III, convenor of the Long Island Motor Parkway, has forwarded a copy of a 1906 brochure for the American Mercedes. The brochure was distributed in 1961 by Mercedes-Benz Sales of South Bend, Indiana. They noted: "This is a faithful copy of a brochure issued in 1906 on the American Mercedes and has been prepared for Mercedes-Benz owners and friend in America". 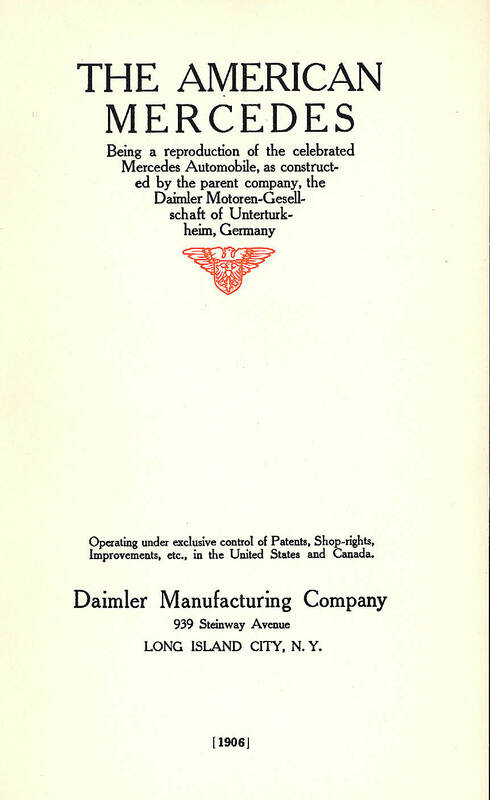 The Daimler Manufacturing Company was located at 939 Steinway Avenue, in Long Island City. Whether or not domestic automobiles will some day be built which will compare favorably with their foreign cousins, is a question which the future must decide. Certainly at the present time the superiority of European cars is unquestioned, and this would seem only we consider that Europe has had some fifteen years the start of us in automobile construction, the first gasoline automobile having been invented by Daimler some thirty years ago, or fifteen years before the earliest American inventors took it up. The American Mercedes for 1906 will be an exact reproduction of the 45 horsepower Foreign Mercedes. Thanks Sam III for your many contributions to VanderbiltCupRaces.com! 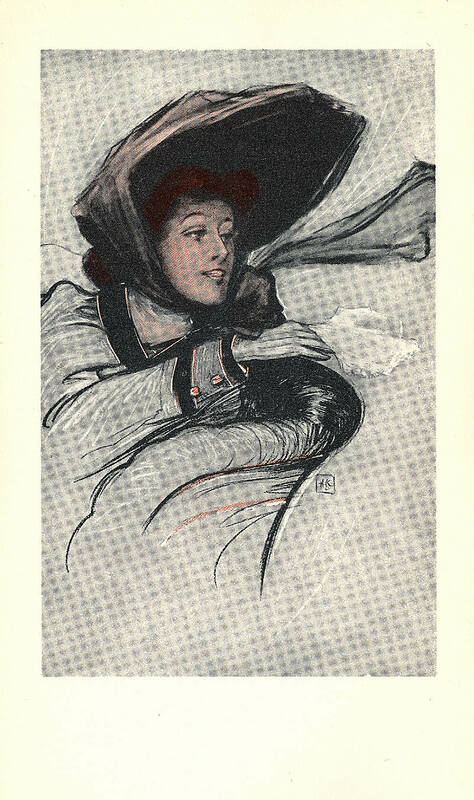 Click here for a PDF of the 1906 brochure. in the last five years I have used most every make of American cars and two prominent makes of foreign cars and must say the American Mercedes is far superior to anything that I have ever used. 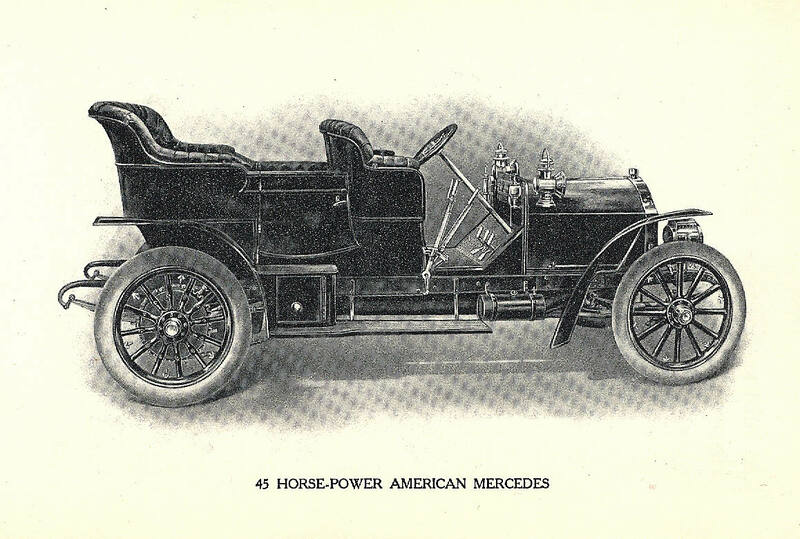 It does not seem to me necessary to purchase a new car every year if you start with a good one...."
I really enjoyed reading the 1906 Brochure for the American Mercedes. As a member of the NYC-Long Island Mercedes-Benz Club,it was a especially relevant for me. I would never have had the opportunity to see this rare brochure, had it not been posted on your fine website and provided to you by Sam III.